The first half of the term is already over! I’ve really been enjoying teaching again. It can be incredibly rewarding and I love sharing my passion for the harp and music in general with my students. 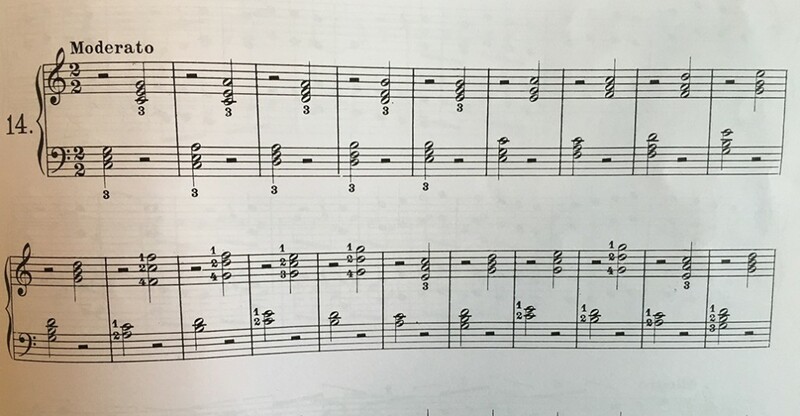 As well as scales, pieces, and general technique, we’ve all been working on noticing shapes in music, particularly that of the triads and their inversions. Reading music is like reading words – you need to be able to recognise the patterns that crop up time and time again in order to read fluently. We’ve also been learning about the key signatures and how you find the sharps and flats for each key. Everyone is reciting the mnemonics Father Christmas Gives Dad An Electric Blanket… Blanket Explodes And Dad Gets Cold Feet! In addition to this I’ve had a busy concert schedule, both performing and watching. A real mix of music! Countless weddings and functions, plus I performed with the award-winning Rhosllannerchrugog Welsh Male Voice Choir for a concert in Lindfield which was a real treat. I went to see Sioned Williams celebrating her 60th and the UKHA’s 50th with a concert in the Purcell Room and that was truly breathtaking, plus really great to see all the other harpists there, most I already know and some I met for the first time. I also saw the Prog Metal band Opeth at the Roundhouse in Camden. It was the first gig of their new tour so they were still getting used to the new material – I would love to see them again at the end of the tour to see how they progress. My partner and I did that with Bonobo’s tour last year and earlier this year, we saw the first concert in London and one of the final concerts in Paris. The difference was amazing! It was a brilliant show to start with, but the final one was just amazing. There was so much energy and quite a different vibe. Also we’re still busy with the Brighton Electronic Music collaboration, [beep]. I went to their last event held at The Verdict on Edward Street in Brighton and it was so much fun. The standard of music was very high, the crowd were enthusiastic, and the venue has a chilled atmosphere and friendly staff. Plus in addition to the usual alcohol they also serve tea and coffee all night. Perfect for me as I obviously never drink when I’m working and if I’m just watching I’m usually driving. Can’t beat great music, lovely people and a nice cup of tea! So this coming Saturday (1st November) I’m performing with my band Cleff at the next [beep] event, again at The Verdict. Tickets are £5 on the door, come along if you’re around and enjoy a good mix of downtempo electronic music! Cleff are also performing the next day, Sunday 2nd, at DV247 in Romford for their store opening. It’s set to be a huge event with electronic music workshops, masterclasses, demonstrations and more! I’m very excited to be part of it.